I barely got enough sleep last night, but at least it was good sleep. The day went ok. I chose to work through lunch instead of going to the gym because I was in the middle of something. That was a mistake, because by time I got done with work today, I could barely stay awake! My afternoon fatigue in the last week has been awfully bad (please don’t let it be AF again). I hope it’s just still from being sick. I lied down on the bed after work when I was on the phone and I thought I was going to fall asleep. Dinner picked me up a bit. By that point it was too late. If I workout after 6 pm, I am pretty much guaranteed not to sleep at night (yes, that means every LUNA Tuesday). Booked someone to mow my grass this week. I just don’t have the time. Thanks ODB for the urging me to do so. It’s early to bed for me, because tomorrow is a LONG day! So I saw my new Dr. on Tuesday afternoon. It was a long 3 month wait for an appt with him. A friend asked how it went. I said “well I didn’t cry on the way home.” Not even joking on that, i’ve cried after every single Dr. appt in the last 4 years. A few of them during the appt. It actually went very well. He doesn’t do medications (he’s a PHD), just supplements. Any medication I need, like natural desiccated thyroid (NDT) will come from my PCP. He was straightforward and blunt. In a caring way. Told me he treat all of his patients like they are family. Came in with a handshake and left with a hug. He talked to me as an athlete and a sister. Something I haven’t considered myself being for several years. So there are supplements. Bust out the “old man” pill box again. He was appalled at the hormones I had been on, so I am not going back there. Staying on the LDN and NDT now. Trying what he gave me for 12 weeks. And then the dietary part. This is the part I am not wild about. Mostly because of what it is. I will do it, because I am more than willing to change what I eat to try to make myself better. It’s all I’ve done for the last 4 years. He wants me to do low glycemic/South Beach 1, 2. BLECH on a diet that is a diet. And BLECH on lowering carbs. I like carbs. I like being healthy and feeling good more. It was a pretty fantastic day! Won a fancy kitchen knife in a drawing. Finally got the calendar refills for my agenda. I can breathe now! I was freaking out not having my calendar. Yes. I keep E-calendars and paper. I got my adrenal tests back. NORMAL, in fact she said I am better than most she sees. She does think that changing job functions to something less stressful and removing personal stress out of my life played a big role. So I am staying low on the running and we’ll see if I can manage it. My thyroid, D, and a few other things are still messed up, but she had some ideas on what to do. As far as my weight gain? No suggestions. I told her I was evaluated by the clinics weight loss center and they turned me away. She didn’t believe me. I told her I had the email confirmation. She said they never turn anyone away. Well if I am not a candidate, i’m not. And I don’t believe in drugs or diets. I eat right and exercise regularly. I journal. Things they make their non-drug patients do, I already do. Speaking of diet, not dieting. I started autoimmune paleo on 1.1.14. As if I don’t have enough stuff cut, I am trying it for 3o days to see if it reduces inflammation and other things. I miss nightshades. And nuts. And all my favorite spices contain nightshades, so I am using a lot of herbs and salt and pepper. 30 days isn’t that long, and then I can reintroduce things slowly and see what reacts and what doesn’t. Already discovered a few weeks ago that almonds are a no. SAD. Overall a good day. We will see how this football game ends. WAR EAGLE! Things I like Thursday: my new Dr.
Ok, well I think I like her. I’ve only seen her once. And she’s not a Dr., she’s a PA. She was super smart and so easy to talk to and SO full of energy. Just talking to her made me happy! So I found her on Facebook. Don’t laugh. I belong to like 10 hormone, adrenal, and thyroid groups on Facebook. Someone asked for a referral in Austin area and 2 others chimed in about this lady. So I wrote down her name and made an appointment in early April and had my first visit with her yesterday. Her office is pretty far from work and home, but if she’s awesome, she’s worth it. My favorite thing is, that she’s into trying natural approaches. She took me off of the estradiol patch, testosterone, DHEA, and halved the progesterone. She added 3 supplements, 2 to help with girl problems and the other to help my iodine levels and a probiotic. So I am still on quite a few things, but less hormones and drugs. Now the majority is supplements. Girl problems? Yes. I haven’t had a cycle in over 2 years. That’s why the other Dr. had me on estradiol and progesterone. I was on both for about 8 months and the patch most recently, which I HATED. Talk about water retention? Yeah. Not pretty. She didn’t like me being on all of that and to be honest, I didn’t like it either. I don’t care if I have a cycle, I just want to be HEALTHY. She told me that everything should fall into place eventually and she thinks she can make my girl stuff and my stomach work right. Those things should be corrected when my hormones and other imbalances are fixed. She said we’ll see how I do on this regiment for a month or so, and then test my levels to see what is going on. They did a thyroid panel yesterday on my way out, but i’d taken my PM dose like an hour before that, so it’ll likely be skewed. I forgot to remind her of that before I went to the lab. So I saw Primal Toad or someone post something about a Facebook hiatus from Tuesday evening until Monday night. He asked you share the status if you wanted to participate. Dan tells me I am on my phone too much anyhow. Mark Sisson and other health bloggers talk about the negative impact of random people, especially not in your core group of friends and family, being a distraction and a hidden stressor. I don’t need any additional stress in my life. So, what have I been doing since Tuesday night’s Facebook hiatus? I deleted it off of my phone. Maybe not permanently, but I can’t screw around on it if it’s not there. I’ve not really used my laptop either, so it hasn’t really been a temptation. I had off of work Wednesday afternoon, through Friday. Medical leave. I am fine. Sad part is, while this little medical break from work cost me a pretty penny and 100% out of pocket, I have been 100% unstressed. Yes, even before I had a gazillion types of medications to take, I was still unstressed. How sad is it that I have to be on medical leave to escape the stresses of work? I didn’t tell anyone why I was out. Not my sister, not my bff, not even my mother. I only got a Dr. note for work, just in case any of my limitations come up. Back to the medical part. I have been in zero pain. Watched several movies, slept on and off many times. While this procedure has nothing to do with my thyroid or adrenal fatigue, I do think that the restrictions I have placed on have to be helping that area. I lowered my work desk to sitting before I left on Wednesday afternoon, because I know it’ll be a few weeks before I can stand full time again. Downfall? No activity, zero walking and any other type of activity, including yoga until maybe April. 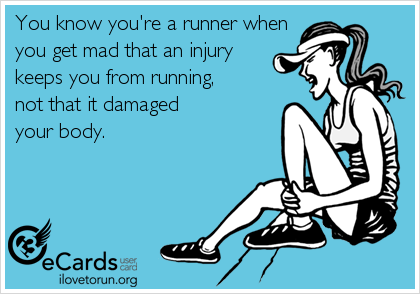 Maybe even starting to run then. I have a follow up appointment Wednesday to address what I can do and when. I got groceries this morning by myself, which was a bad idea. I didn’t exceed weight restrictions, but having someone to help would have been easier. Dan took really good care of me, but it’s become pretty obvious how much housework I do on a daily basis around here. Even though I haven’t been cooking since Wednesday night when we got home, the kitchen was a wreck 3 times. I am not talking small wreck. I am talking both sides of the sink full, plus dishes on stove and sides of sink. Clean dishes in dishwasher. Dishes ALL OVER! I just about had a melt down over it several times. I didn’t misbehave and touch any of them, but I just about lost is seeing everything in such a mess. Dan cleaned it all up before leaving for a funeral this morning (I couldn’t go, I can’t be in the car that long yet). I also have my next hormone appt at the end of March. That ought to be interesting because I had to go off all hormones, except thyroid before surgery. I will not have enough time to resume the other hormones before I return to the Dr mid-march. I am thinking about letting them just test me wherever I am at this point, with just the thyroid and nothing else in my system. It’s probably a good way to see if i’ve been wasting money on all of the other stuff i’ve been consuming for months. If my levels don’t look any different without them in my system, I can’t say that I am convinced that I want to keep taking all of that stuff. I honestly hope I can convince the hormone Dr. to raise my thyroid again (which is low according to every blood test I have had in the last 2 months). Don’t ask me why when he sees it is low, that I have to wait a whole month to address the stupid levels! In fact, it’s so low, the surgeon was on the fence about letting me go through with everything on Wednesday. So here’s to the stress staying at bay, for full and happy healing, and getting back to the things I love all in due time! Minus Tuesday, which was a super high stress day at work, I have been feeling GREAT! Like I stayed out until 3 am on Saturday morning and I didn’t take a nap Saturday OR Sunday (although for my adrenals, that a nap probably would have been wise). And I have actually slept at night! Granted, I am still waking up at least twice, but once of those is by alarm to take my early morning dose of thyroid. What have I been doing other than the new supplements, along with my regular medication? Yoga. I did Yoga, Friday, Saturday, Sunday, and Monday. My favorite of course is the class at Lululemon. I wish they were having them there in February. I did a small amount of Galloway before yoga on Sunday and it felt fine. But my issue wasn’t always how I felt, it was what my body reacted to on the inside. I haven’t done it again since. Maybe today. Giving. I took half a day off on Friday, so I could volunteer for the Rogue 10k/30K packet pick-up. I may have played hookie 🙂 I got to hang out with my gal Jenn and meet some new people. Fun. 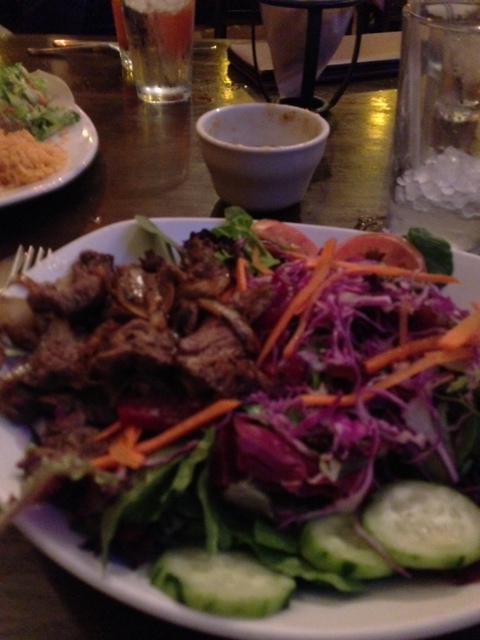 Dinner at Garrido’s with Dan and our friend Heather on Friday night. 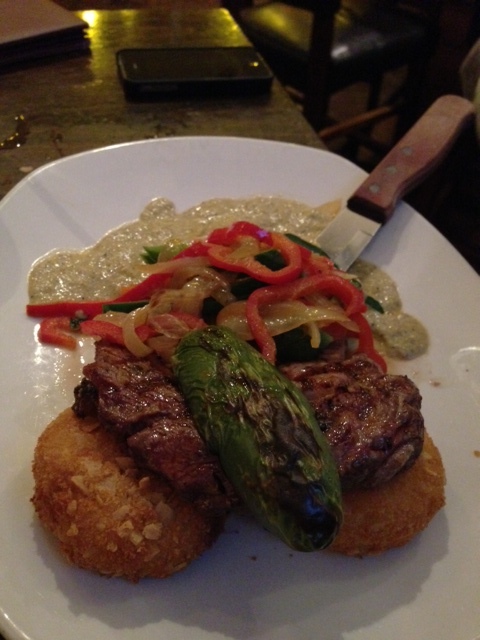 Is it just me, or does Dan’s steak, over potato cakes with giant roasted jalapeno on top look kind of naughty? Yeah, 90% of their menu is GF, I think he ordered that to keep me paws off of it (the potato cakes aren’t GF). I got steak too, sorta. We didn’t eat dinner until late, so this was actually a 2nd light dinner for me. There was no way I could wait until 8:30 to eat! Drive By Truckers show at the new Emo’s east after dinner. If it weren’t for drunk college kids, it would have been the perfect evening. Music heals. This girl doesn’t do front row for ANYONE anymore. But no matter what I say or how crazy the crowd is, I ALWAYS end up in the front row for DBT! 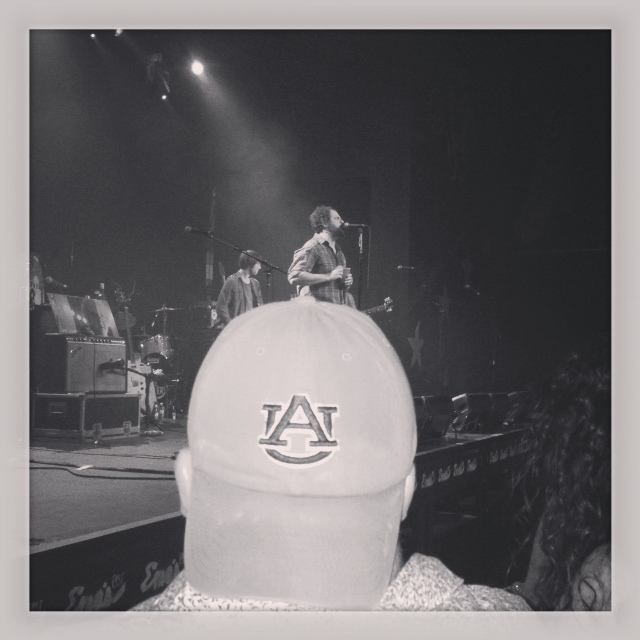 That’s my trying to be artistic pic of my Alabama guy, watching our favorite band from Alabama! We didn’t get home until 3 am. WHEW! Long Friday was SO worth it. Exactly what we needed. Saturday and Sunday, I worked on a few projects that were long overdue and did my taxes. Now I am waiting for Dan to do his, to decide who claims the house (depends who benefits more $ from it). Besides some stress hiccups from work, I am feeling GOOD! Praying this lasts!